This recipe has been one week in the making, but believe me, it’s worth it. And I don’t even like bananas all that much. If you do like the taste of a nice, ripe banana I’ll almost guarantee you will like this liqueur. 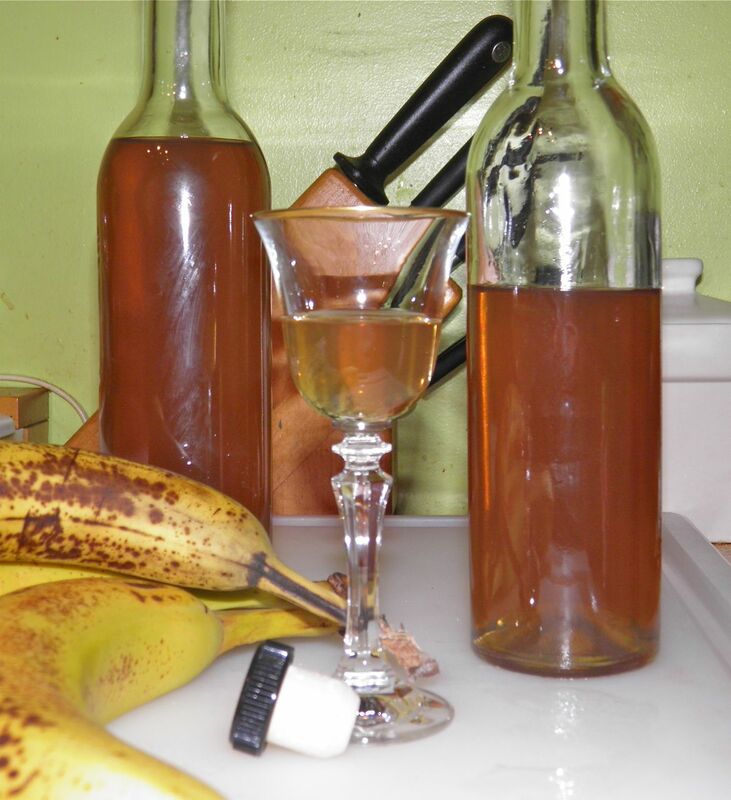 Forget what you know of store-purchased banana liqueur. This has natural taste and colour. rose liqueur is beside the computer screen in the rear. 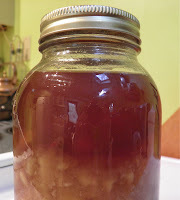 I started this recipe as one of my gift liqueurs for Christmas, but it may not make it that long. I did find out something interesting in looking at recipes: there’s “banana liqueur” and then “crème de banane.” The difference is is sweetness and alcohol content. 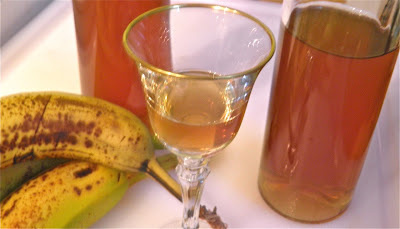 Banana liqueur is straight up bananas with a little sugar in booze. To make the far more fancy sounding crème add a sugar syrup. The crème is less alcoholic at about 25% alc. vol. and the recipe makes a greater quantity. Perfect for gift giving! Crème de banane is the one most often used in fancy drinks. It also has applications in the kitchen besides in a glass beside the chef. Chilled crème de banane can be used as a syrup on frozen desserts, or it can be incorporated into baking to add a boost of banana flavour. I found an amazing banana pudding recipe I’m going to try and it would probably add quite a kick to banana bread, which I love. Take care in selecting your two bananas. They need to have well developed flavour to translate into the liqueur. NO green bananas!! 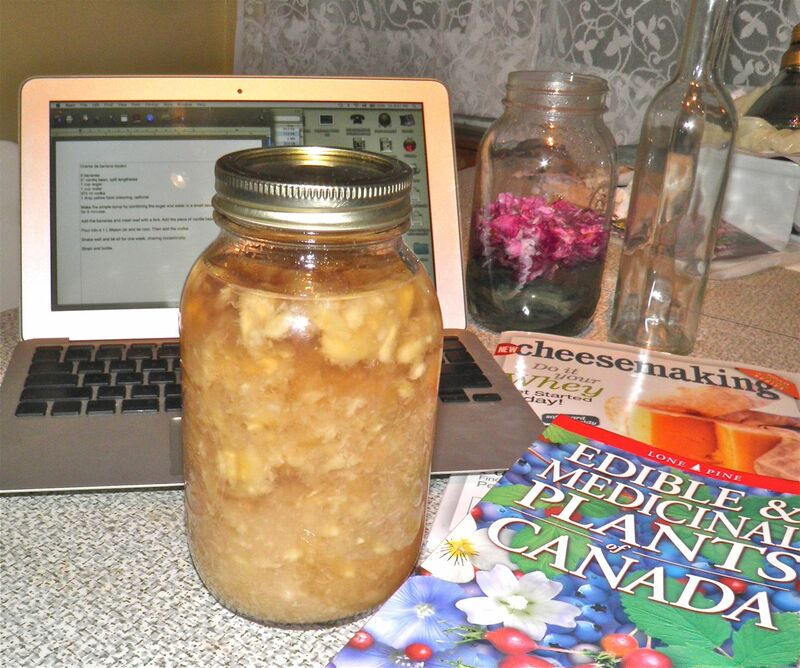 Peel them and cut into chunks..
Make a simple syrup by combining the sugar and water in a small saucepan. Let it boil for 5 minutes. Add the peeled bananas and mash well with a fork. Place the piece of vanilla bean into a 1 L Mason jar. 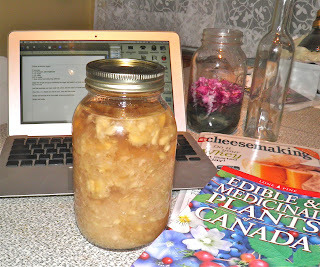 Pour the banana mixture into the jar and let cool. Then add the vodka. Shake well and let sit for one week, shaking occasionally. The liquid will become quite dark, much like overripe banans. It's fine, don't worry. Strain at least twice through fine cloth and bottle. 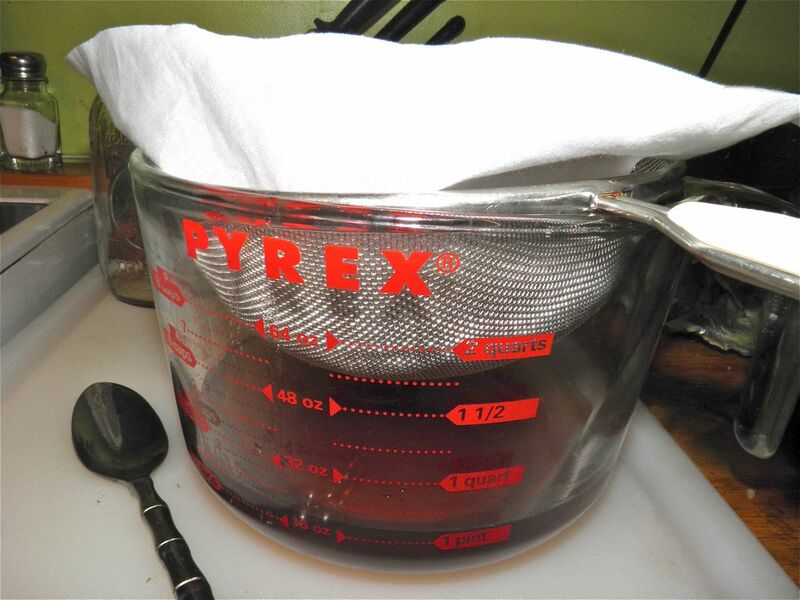 I used a jelly bag first, and then a piece of pillow case. It came out fairly clear. I added the food colouring to give it a slight, golden hue. We all know the colour of over ripe bananas! This is my second straining, through fine weave cotton. That last one has me intrigued... I'm not much for creamy drinks although my Creamsicle liqueur recipe is quite good. If you're interested the recipe is here. What if the batch comes out not...banan-y enough? Do I just add more banana and then set and strain again?